Keeping a roof in top condition can save thousands of dollars and prevent serious complications. From age, weather conditions, and growth of micro-organisms, a roof can become dirty, dingy, and off-color. A dirty roof can cause a nose dive in overall appearance. But, this problem can be fixed with a simple solution: power washing. 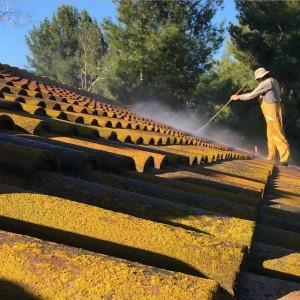 Power washing is a reliable means of cleaning a roof without damage, without harmful chemicals, and without taking up a lot of time. Reaching the tough dirt that is embedded into tiles. Due to the power of the wash, resilient dirt and micro-organisms will be forced away. A power washer’s spray can emit water to a distance, which makes it safer to clean the ridges, peaks, and taller spots on the roof. Power washing can be eco-friendly with a safe cleaner that won’t pose any harm to the environment or those living in the home. 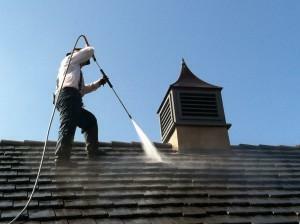 Power washing will lengthen the life of your roof. Micro-organisms such as mold and algae can eat away at shingles and damage the foundation. When fungus grows on your roof, the pigmentation of the fungus absorbs more heat and keep temperatures higher, resulting in harder working air conditioning units. Washing fungus off your roof will reduce energy costs. If you are looking to sell your home, your roof is an important asset. Your roof makes up 40% of curb appeal. Potential home buyers will certainly note a roof that is dirty. You can avoid a costly roof replacement with a power washing. A dirty and un-kept roof is a precursor for major roof damage. For a professional power washing service, contact Custom Coating Restoration today.